Tying Good Fishing Line Knots Is An Important Skill - Why? Because Poorly Tied Knots Guarantee Lost Bass! There is an art to tying fishing line knots that will strengthen rather than create a "weak point" in your line. It's the nature of knots, however, to weaken line to some degree. It's unavoidable. So choosing the correct knot for the circumstances is the first step. 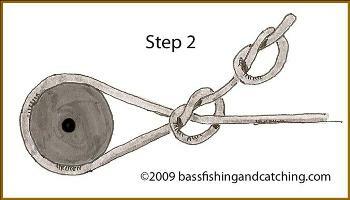 Next is to tie your fishing line knots "properly". On the next few pages you will find knot tying illustration and knot tying instructions to enable you to properly tie bass fishing knots. Try to use the simplest knots to tie. You'll reduce your odds of knot failure. Wet your line before "cinching" down your knot. Friction is generated as line rubs across itself and friction weakens line. Applying moisture will reduce friction and correspondingly reduce the "burn", nicks and abrasion caused by friction. Don't cut the tag end to close to the knot. A little extra line will cover any slippage that occurs. Retie your knots often throughout the day. In fact, retying after each fish is not a bad idea. When you do retie, strip off a couple of feet of line in front of the knot in order to discard line that may be nicked or abraided. Get yourself some clippers! Don't bite your line to cut it. A pair of nail clippers is much less expensive than a dental crown! I speak from experience. Standing Line - The main line attached to your reel. Wrap - A full circle of line around the standing line is called a "wrap". If the line begins its wrap on the side of the standing line "away" from you, it should end on the side away from you. This constitutes a complete wrap and the tag end should finish-up in the same place it started. Tag End - The free end of the standing line left after the knot is completed. You clip off the tag about a eight to no more than a quarter inch from the knot. The last point above is important because you don't want to be on the water and have to refer to a book or chart for directions on how to tie some exotic knot. Knot Numero Uno - The Arbor Knot! Obviously, you must first get your line attached to your reel. The Arbor Knot is the fishing line knot which accomplishes this. It's sometimes referred to as a "Reel Knot". It's quick, easy, because it's just an overhand knot, and essential. Why essential? 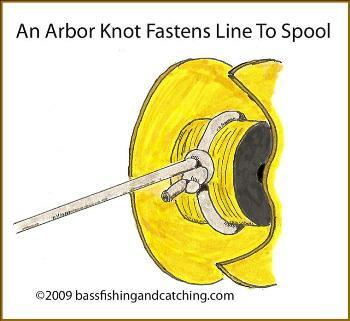 Because, if you don't tie this knot well your entire spool full of line may rotate when the arbor is under pressure. The problem with this happening is obvious. Step 1 - Loop line around your spool's arbor. Take the "tag" end of the line and tie an overhand knot as shown. Step 2 - Tie a second overhand knot in the tag end as close to the first knot as you can. Step 3 - Pull the main line and both overhead knots will slide together and snug against the spool. Clip off the remaining tag end no less than 1/8 inch from the knot. The one knot you should learn. It can be used 90% of the time and is easy to tie. A great line to lure connector. Arguably the most popular knot for joining terminal tackle. It's strong and easy to tie. It isn't a good choice for braided line. A very good alternative to a Clinch knot. It's easy to tie and reliable. A very easy and strong knot for joining terminal tackle. It is vulnerable to breaking when subjected to sudden jerks however. Good for braided line. The quickest knot to tie for joining two lines of "unequal diameter". The best for joining two lines of "equal" diameter and dissimilar materials like monofilament and braid. Blood Knot Good for joining together main line and leader of approximately the same diameter. Now, let's learn how to tie the best fishing line knots, or perhaps I should say the best bass fishing knots. The Improved Clinch Knot. A General Purpose Knot For Monofilament Line. How Do You Tie A Uni-Knot? Line To Line Connection? Use the Double Uni-Knot.